Have you ever thought about setting goals for your marriage? Does that sound absolutely ridiculous to you? I mean marriage is just that, marriage. It is what it is, once you’re married. I think we all can say that when we tied the knot that we had the goal of being married in 25 years. No one has the goal to divorce in 7 years. We all have goals in marriage, whether it’s a conscious choice or not, whether you write them down or not. Setting goals can transform your marriage. Goals can revive a dying marriage. Goals can make a thriving marriage even sweeter. Goals can deepen your love for your spouse. Goals can change your perspective. Goals can make you fall in love again. Goals give you more of a chance of beating the current divorce rate. If we aren’t intentional with the direction that our marriage is taking, it may be heading in a direction that we aren’t happy with. Just like a ship is just a ship it still needs to be set on course and sailed in the right direction, our marriage needs goals and direction. A floating, listless ship is of no use to anyone. Your marriage doesn’t have to be that way. We have a choice to cultivate a loving relationship or one that’s filled with contention and grief. If your marriage is struggling or if you’re lacking the passion and love you had at the altar might I suggest that you set some goals for your marriage today. A marriage left to grow stagnant will be an unhappy marriage. Marriage goals can save your marriage and make it sweeter than ever! This all sounds good, right? But how does one make this practical for marriage? Your marriage can’t lose 30 pounds or do a lot of the “normal” goals that you hear of when you think of goal setting. At this point, you may be thinking “okay, Ana, I get it. I need some goals but I’m clueless where to start.” It’s not as complicated as you might be thinking. I want to break it down for you with some examples. Monthly out of the house date nights. Write the occasional love notes. Say 3 compliments to each other every day. Read 1 book each month that deals with communication in marriage. Those are just some examples of areas in marriage that you can set goals, I’m sure there are many more that could be put into place from your own marriage. Setting goals for your marriage is you deciding that you are not going to let your marriage fizzle out, that you are going to be intentional with the direction of your marriage. Without goals, you could be weakening the walls of defense surrounding your marriage. We are in a battle for our marriage, the devil would love nothing more than to destroy another Christian marriage. Let’s take charge and put some goals in place that will transform our marriages. 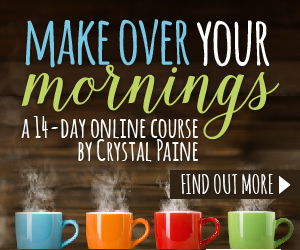 The one tool that helped me see the need for setting goals for my marriage was Crystal Paine’s 4-week Make Over Your Year online course. This course is not just for business people, it’s not just for college students or those who have big lofty dreams in mind. It’s for us everyday women with marriages, children, and homes to care of. Make Over Your Year walks you through determining your big priorities, in this case, it would be within your marriage, and then she shows you to break those down into bite-sized chunks so that you can actually achieve your goals. After completing Make Over Your Year for the first time, I set a simple goal of going out on 1 out o the house date each month. I was amazed at how this one simple goal transformed our marriage. We were closer, more in love and communicated so much better when we stepped away from the chaos of parenting and business once a month and simply focused on each other. After that year’s success, I added some more goals for my marriage the next year after going through the course a second time (you have lifetime access!!). You won’t ever regret the time you spend on your marriage. The course comes with short videos, workbook, and projects to help you in your journey. You’ll be amazed at how your marriage will be transformed once you set goals! I sure was! Are you ready to try out goal setting in your marriage?